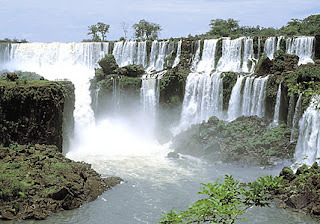 Visiting Argentina and Brazil, do not miss to visit one of the wonder, the Iguazu Falls. Terraced waterfall offers a beautiful natural phenomenon and very impressive. Iguazu Falls phenomena created by the friction of tectonic transformation events, resulting in a canyon or a giant canyon that makes the river with a high fracture differ in thousands of years ago. Millions of water volume at the same time falling from a height of approximately 100 meters, forming a crater at the bottom of the river is amazing. Iguazu Falls scenery that always rise to millions of tourists come to see firsthand one of UNESCO's world heritage and preserve its uniqueness. Iguazu word itself comes from the Guarani Indian nation that has a meaning "large water". This waterfall is uniquely located in the middle of the forest area, between Brazil and Argentina. Remarkably, the two countries conduct joint maintenance by establishing a national park to protect the environment and conserve flora and fauna that exist in the Iguassu Falls. The uniqueness of Iguazu Falls that are not owned by other large waterfall which is similar to her two-tiered, with a large size and nearly the same height. So, there Iguazu river water that falls in the form of a giant waterfall into the river at the bottom with a height of about 60 meters to 80 meters. Then rushing to then fall back into the river below it again with almost the same width and height. Forming a very beautiful scenery. Especially when viewed from afar, either through the river below, or through the air. The national park has a tour bus lane infrastructure and special railway for tourists indulge so no need to walk far to enjoy the beauty of national parks that have thousands of acres of this area.